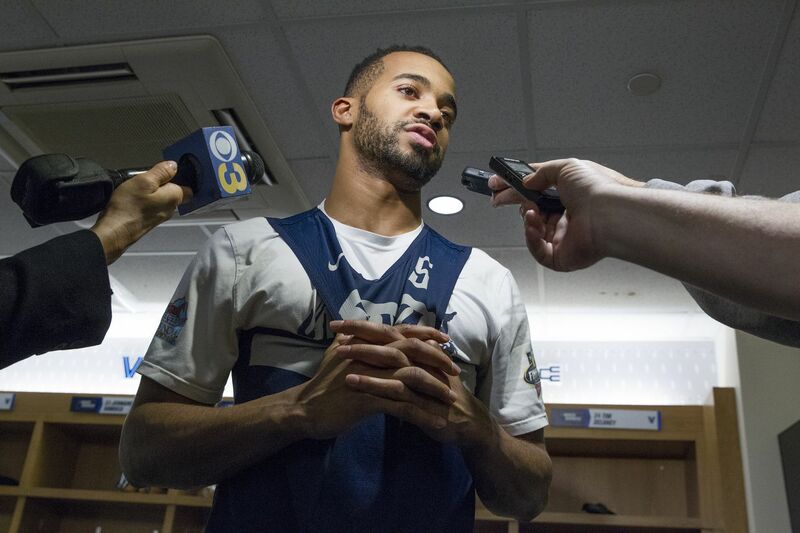 Phil Booth of Villanova is interviewed in their locker room. They will play Purdue in the 2nd round NCAA Tournament game at the XL Center in Hartford, CT on March 23, 2019. HARTFORD, Conn. – Phil Booth continues to quietly go about his business leading Villanova while adding a couple of impressive numbers to his already voluminous resume. Booth played in his 147th game, the most in the history of the Wildcats’ program, Thursday night, in a 61-57 first-round victory over St. Mary’s in the NCAA Tournament. He also tied an NCAA record by being part of a 13th consecutive tourney win, and he can break the record Saturday night, when the Cats (26-9) take on Purdue (24-9) at XL Center. Booth broke the program record of 146 games played, a mark shared by Josh Hart and Kris Jenkins. He need eight points to reach the 1,500-point milestone, and would become the ninth player in school history to compile 1,500 points and 300 assists in his career. Four Duke players – Grant Hill, Thomas Hill, Bobby Hurley, and Antonio Lang – won 13 consecutive games in the NCAA Tournament, fueled by back-to-back national championships in 1991 and 1992. Booth played on Villanova’s 2016 and 2018 championship teams but did not compete in the 2017 tournament because of a knee injury that forced him to redshirt. Wildcats coach Jay Wright appeared awed by Booth’s milestones. “Just here in the short term, that record is incredible,” he said. “He’s just going to go down as a real special player in Villanova history. But being in this tournament right now, and thinking about 13 straight wins, that’s incredible. That’s really incredible. Another player who has shared successes with Booth over an extended period is senior Eric Paschall, who has teamed with Booth to lead the Cats on and off the court. The underclassmen also appreciate the records, even if sophomore Collin Gillespie and his teammates joke around with Booth all the time. “We look at him like he’s been here for 10 years,” Gillespie said. The Wildcats want to keep going and to add to Booth’s records, not to mention advance to the Sweet 16, but they face a tough task against the Boilermakers. Purdue features junior guard Carsen Edwards and his 23.1-point average, and is strong on defense and under the boards.